Relax and Refresh | Delicious! Although living in Florida has its perks, like never being too far from the beach, one downside is how hot it gets! Summers here can reach over 100 degrees. Sometimes after being out in the hot sun your sweet tooth starts hurting. However, you don’t always want some heavy, rich treat. You want something lighter. Here are a few treats that will help you refresh! Sprinkle 2 tablespoons of the macadamia nuts in the bottom of the pastry shell. In a small bowl, whisk together limeade concentrate and vanilla pudding mix. Set aside. In a medium mixing bowl beat cream cheese with an electric mixer for 30 seconds. Beat in powdered sugar, followed by limeade mixture. Transfer 3/4 cup of the mixture to another medium bowl; set aside. Spoon remaining mixture into the pastry shell. Top with two of the kiwifruit. Beat yogurt into the reserved 3/4 cup cream cheese mixture until combined. Fold in whipped topping. Spoon over filling in pastry shell. Cover and chill 8 to 24 hours. 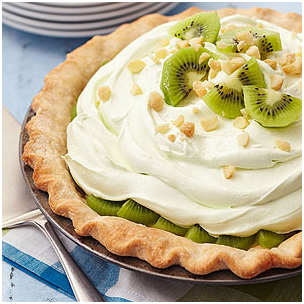 Garnish with remaining kiwifruit and nuts. Makes 8 servings. Add fruit to the bowl of a food processor. Process to a rough puree, about 1 minute. Add the sugar or another sweetener and pulse briefly to combine. If you're using a different sweetener, add a small amount at a time to taste. Add the egg white and process until smooth and fluffy and the mixture has lightened in color and doubled or tripled in volume, 2 to 3 minutes. If the mixture clings to the sides of the food processor's bowl too much (this may happen if the blade doesn't extend all the way to the sides of the bowl), transfer the mixture to a normal medium-sized bowl and beat with a mixer fitted with the whisk attachment until fluffy. 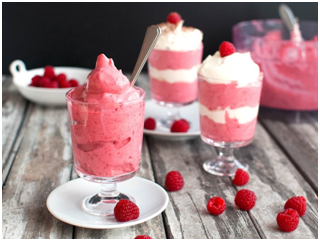 Spoon the mousse into glasses and top or layer with fresh berries and/or whipped cream (optional). Serve immediately or store in the refrigerator for up to 2 hours (because this mousse has very little sugar in it, it's not very stable and it won't hold for longer than that).